Looking For Fishing Line & Wire? Fishing wires in your home can be a challenging exercise. With walls and ceilings finished getting a new electrical circuit, the continuation of an older electrical circuit, cable, satellite feeds or speaker wires from point A to point B generally requires a lot of thought and ingenuity. While there is no guaranteed method, there are some basics that you should keep in mind when attempting to fish wires through covered walls. Sometimes it is much easier to take a longer route, using more cable than it is to try and find the shortest route from A to B. If you have an unfinished basement ceiling or a basement ceiling that is suspended, in theory you can access any point in the floor above, once you are in the basement. The same or similar situation applies to the attic space, if it is unfinished, once you are in the attic, you can reach any point in the living space below. Vent stacks run from the basement of a home, up through the living space, into the attic and out through the roof. In many cases when the vent stacks were installed the holes or notches that were placed in floor boards, upper and lower plates and headers were slightly larger than the diameter of the pipe. You might be able to use the extra space around vent pipes to run wires. A tool that is extremely handy and not expensive is a fish tape , as shown in Figure 2. A fish tape allows you to snake through some extremely tight and awkward locations. Remember that very few internal walls are insulated, hence if you can access the bottom and top of the wall, you can drop a fish line through a hole in the top plate of the wall and pick it up through a hole in the bottom plate. It can be tricky to find the base of the wall in the basement that you want to run through. There are two methods to identify the location of the wall from the basement. You can usually find the area and you can look for electrical wires that are already running through the ceiling and into the wall you wish to access. You can either use this hole if there is enough space around the current wire or drill another hole beside it. If there are no wires currently running up and into the wall. Remove the baseboard on the wall and drill a small hole (large enough to stick a coat hanger through) at an angle into the basement. Push the coat hanger through the hole and it should appear in the basement ceiling. Remove the coat hanger and drill straight up. If you angled correctly you should be in the middle of the wall plate. Running speaker, cable and satellite feeds behind baseboards is also possible. 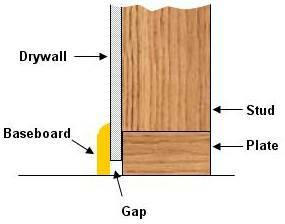 In most cases there is a 1/2 inch gap between the bottom of the drywall and the floor, see Figure 3. (If there isn't a gap, you can create one.) The baseboard neatly hides this gap and there is no problem in running low voltage cable in this area. If you use this area to run wires, be cautious when nailing the baseboard back on. Keep the nails high so as not to hit the cables that you have installed. Another method of running wires from the basement and into the attic is to use the back corners of closets. The wire can be easily hidden by using a concave molding or a plastic or metal wire channel (raceway), see Figure 4, which is designed for running wires on the outside of walls. If all else fails you can run a PVC conduit from the basement to the attic on the outside of your home. Areas that are difficult to feed wires include any opening such as windows, doors and a pass-through. These areas are constructed using solid headers, usually 2 × 8, 2 × 10 and sometimes 2 × 12 lumber placed on its edge. Trying to feed wires past these headers is almost impossible. If you are successful at fishing a wire through a difficult area, it is always wise to also fish an additional string or single wire that, if necessary, in the future would allow you to pull another wire through the same area. Of special note, when fishing through walls, especially in older homes, it is not uncommon to face a fire stop in the wall. A fire stop is a piece of 2 × 4 run horizontally in the middle of the framing. Its purpose was to prevent the spread of fire through the spaces between studs, between floors in a home. There is little that can be done if you face a fire stop in your attempt to fish a wire that does not require some damage to plaster or drywall. The easiest way around the problem is to drill a hole above the fire stop at an angle that will go through the fire stop. Fish the wire from above to hole that was made and then fish the wire through the hole in the fire stop. This hole need be no larger than 3/4 of an inch. So the repair is not overly onerous.